Adult eastern brown snakes are highly variable in colour. Whilst usually a uniform shade of brown, they can have various patterns including speckles and bands, and range from a very pale fawn colour through to black, including orange, silver, yellow and grey. Juveniles can be banded and have a black head, with a lighter band behind, a black nape, and numerous red-brown spots on the belly. They share some similarity with the Taipan. This species has an average length of 1.5 to 1.8 m and it is rarely larger than 2 m. Large eastern brown snakes are often confused with "king brown" snakes (Pseudechis australis), whose habitat they share in many areas. 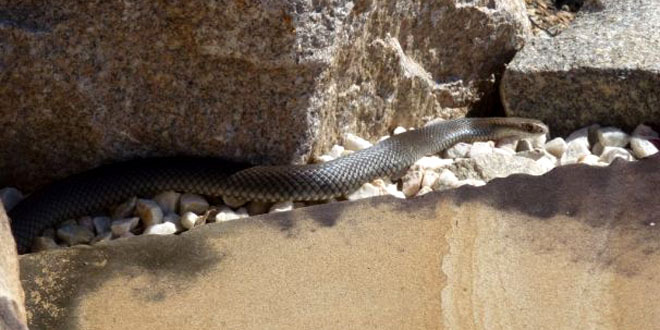 The Eastern Brown Snake enjoys dry areas that offer plenty of ground cover. They are typically timid creatures however can be confident and agressive if provoked. This species is often found sunning themselves on rocks near cover, as shown here, they are quick to disappear at short notice. These, like other snakes, should be watched from a safe distance from when a snake catcher is called to when they catch the snake. This gives the snake catcher the best chance of locating the snake and removing it. As a result of their aggression, speed, accuracy, attitude and toxicity this is definately a snake that should be left for the professionals. A bite from this is most certainly life threatening! Eastern Brown Snakes have been located in and removed from a number of Brisbane suburbs including Strathpine, Samford, Dayboro, Eagle Farm, Petrie, Narangba and even Nudgee Beach. They have also been spotted in Cashmere, Lawnton, Warner and Kedron. There have been many other sightings however they are often mistaken for other non or mildly venomous snakes. 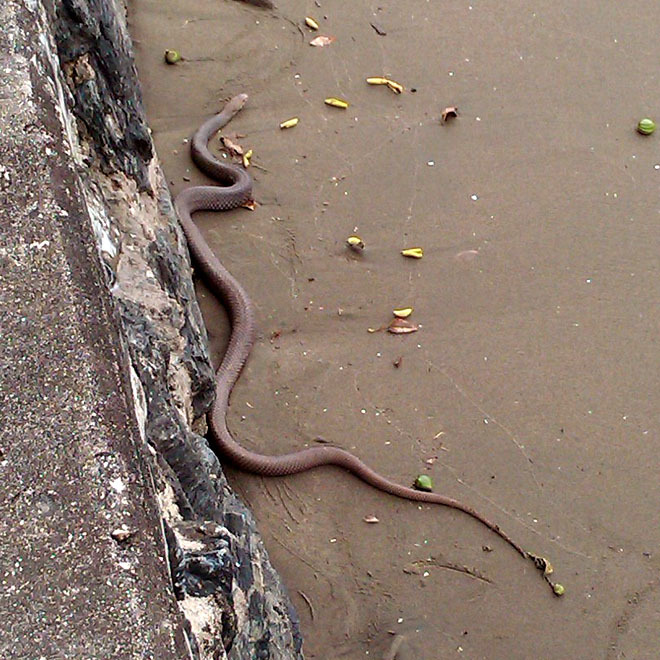 The bottom picture is of an Eastern Brown Snake that swam in from the ocean at Nudgee Beach. I believe the snake would have lived on the other side of Kedron Brook floodway however has ended up on the wrong side of the stream. This snake was 20m from the concrete ramp that many people use to take their dogs for a swim. The snake was relocated across to the other side of the Kedron Brook floodway with the help of a friendly boaty. 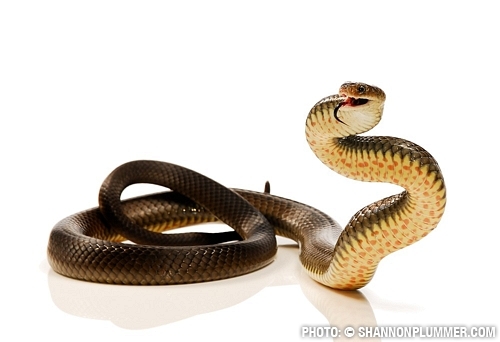 Even though these snakes are listed as the second most venomous land snake in the world they are still protected! Not only is it illegal to harm, kill or catch (unless licensed by the Department of Environment and Resource Management) these snakes it is also dangerous. Only trained professionals who understand the risk, are trained in first aid and are fully licensed and insured should relocate these beautiful animals. They are part of our natural habitat and should be respected as such. The Eastern Brown is a land based snake which likes to hide under or in objects. To reduce the chance of an Eastern Brown taking residence on your property it is best to keep the lawn mowed and the yard clutter free. Avoid ground cover that may provide cover for the snake. Pet cages attract mice which may in turn attract the Eastern Brown. If you live in a high risk area I would recommend you build the animal encosures well off the ground leaving the underside unobstructed so you can see if one is hanging around. 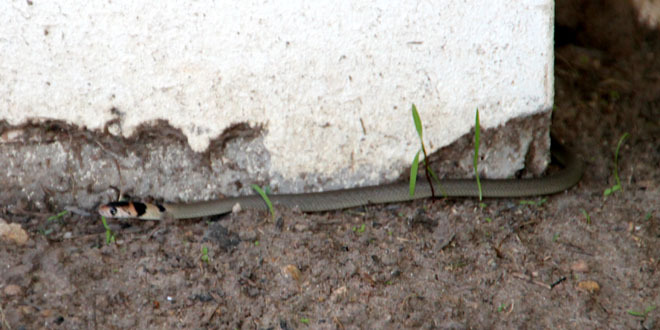 Below are a couple of photos of an Eastern Brown Snake in Cashmere, to the north of Brisbane. This presents a dangerous situation because it is next to a path. When building in areas known to have these snakes it is best to avoid cover near paths. Cover can be plants or rocks etc. Rocks also warm up providing a great place for a snake to bask.